Australia's works Benelli rider Peter Goddard crashed out of the 13th and final round of the World Superbike Championship motorcycle series at Imola today. The 38-year-old from Wollongong crashed on lap five of the first of the two 21-lap races. He bruised his kidneys in the incident and did not ride in the second race. Goddard finished his second successive season riding the three-cylinder Benelli Tornado 900 in 22nd position in the championship with 23 points. He scored points in nine of the 18 races he contested this year, with a best result of 11th in race two of round 12 at Assen in the Netherlands. 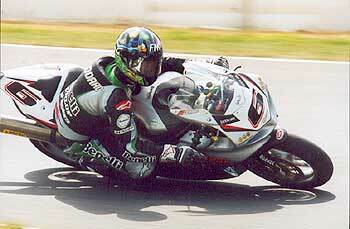 American Colin Edwards clinched the championship title by winning both races at Imola on a Castrol Honda. Australia's Troy Bayliss was second in the two races at Imola on an Infostrada Ducati and finished runner-up in the championship. Goddard, who won the World Endurance Championship in 1997, expects to remain in Europe for another two weeks and is considering various riding options for next year. After returning home he said he would probably attend the Australian Motorcycle Grand Prix at Phillip Island on October 20. PETER GODDARD QUOTES: "I crashed after a bolt came loose in the engine and oil was sprayed all over the back wheel. As I braked into Turn One the back came around, I went sideways, and then it 'high-sided' me off. I landed quite heavily on my back. The doctors had a look at it and said my kidneys were bruised. They put ice on it to stop the inflammation, and we decided it would be best not to risk anything and miss the second race. It was a disappointing end to what has been a tough season. I've given 100-percent to the Benelli project in the last couple of seasons. I'm looking at some things for next year, and my aim is to get on a competitive bike." Send your friends an online postcard.